I was pregnant with #5, and was also helping homeschool my 12yo sister, at the time. 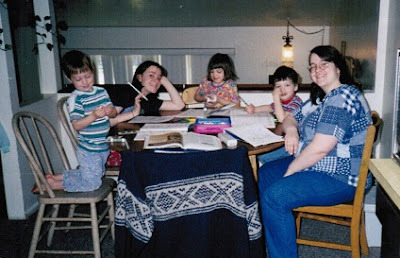 My blogging, much like my homeschooling, has been a journey, with many twists and turns. And with each of those forks in the path, both have changed to better suit my present circumstances. In all truth, I feel that I am an unschooling "refugee." After being a "conventional" homeschooler for the first two years of our homeschool (notice the workbooks in the photo above), I stepped into the dark and took the route of mostly unschooling. We read a lot of good books out loud, as well as independently, and I did a lot of study on my own. We were busy with Park Days and seminars when the kids were young, and as the older kids began moving into their teen years, we joined in some weekly supplemental classes with homeschooling friends. Most of my kids did fine with these classes, though some did not do well with them. Still, we were having fun, and our kids did learn to read, even if it was a little "late". My older kids continued to grow (they do that, you know...), and before I knew it their homeschool years were done. There were things our grown children could do really, really well: discuss great books and ideas, memorize and recite Shakespeare, understand and defend the U.S. Constitution and early American history, ballroom dance, give a speech, sing, perform on stage, create games, and even help teach classes. And that is all wonderful-- I am so proud of them! But there were things that they did NOT learn: how to write an essay, write in c ursive (my sons-- my girls learned to write in cursive because they wanted to), advanced math from Algebra and beyond, how to prepare for college as an option, how to learn and improve in playing an instrument, how to submit to a teacher or parent, how to love and appreciate poetry, how to fulfill an assignment, how to push through things they did NOT want to do (that's the biggest one, I think). I wanted so much for my children, and yet, I just thought they would spontaneously learn all the things that I wanted them to know. But they did not. How could they without the careful guidance they truly needed? Our home environment was helpful and important. But I am here to tell you that it was not enough. We had rich resources and lovely living books all around us, but it was not enough. What we needed was a plan, and consistent, every day, regularly-scheduled home-schooling. As a result of our "Grand Unschooling Experiment", I now approach homeschooling our children left at home in a different way than I ever have before. We read lots of good books together, and on our own. We gather to discuss great ideas and great books and movies. We sing together at home and perform together onstage. Each individual has personal interests they pursue. We each pitch in to take care of our home, yard, and each other. I want to truly LEAD, GUIDE, and WALK BESIDE my children in their academics, as well as in the rest of their lives. And what is life, if it is not about learning?